← Conscious Evolution Circles Starting at TCHE! Click the image above to print the flyer and share it everywhere! 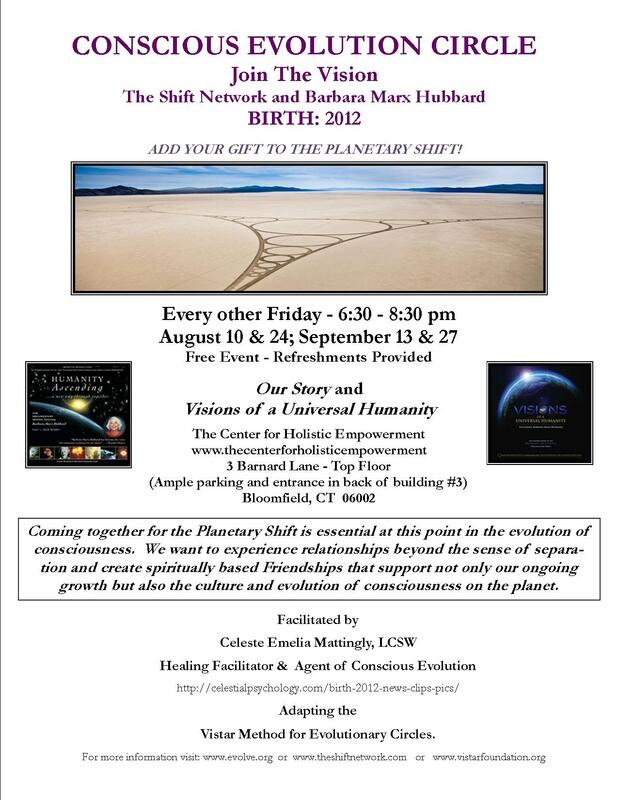 We have begun the planning for the December 22, Birthday Party for the New Humanity and the work of The Shift Network and Barbara Marx Hubbard. Get in on the planning, bring your creativity and sign up for your own hour as a non-paid presenter/facilitator, ie, bring your gifts to the shift! These Circles are designed to announce a variety of opportunities to get involved with assisting the Shift in consciousness necessary to bring about the global heart resonance needed to birth us into the new humanity. In these troubled times we need a collective vision – a vision of a bright and glorious future where we will live in peace and harmony. Every other Friday evening is our Free Introductory Circle. We meet from 6:30 to 8:30 and alternate viewing the 2 documentaries that beautifully outline where we were, where we are and where we are going as a species. We participate in a structured group process and a guided meditation designed to assist us find our niche and determine the ways we would like to get involved and how deeeply. We review how to become an affiliate of The Shift Network which enables us to actually earn some money while promoting the ever-increasing, ever-exciting educational programs that are being offered. We are brainstorming ways to get involved with the planning of the Dec. 22 global birthday party.